A couple of weeks ago I wrapped up my 2016 State of Financial Presentations survey. Thanks to everyone who participated and promoted it. Today I want to share the highlights of the results and what they mean for presenters in general. The full report of results is on my website. The results did not surprise me. In the general survey on PowerPoint presentations information overload comes out as the top issue in presentations today. In financial presentations, this shows up most often as spreadsheets on slides. But this is a lesson for all presenters as well. Whenever you have to present numbers, be careful about how many you use. The audience isn’t looking for every number, just those that are important to them. 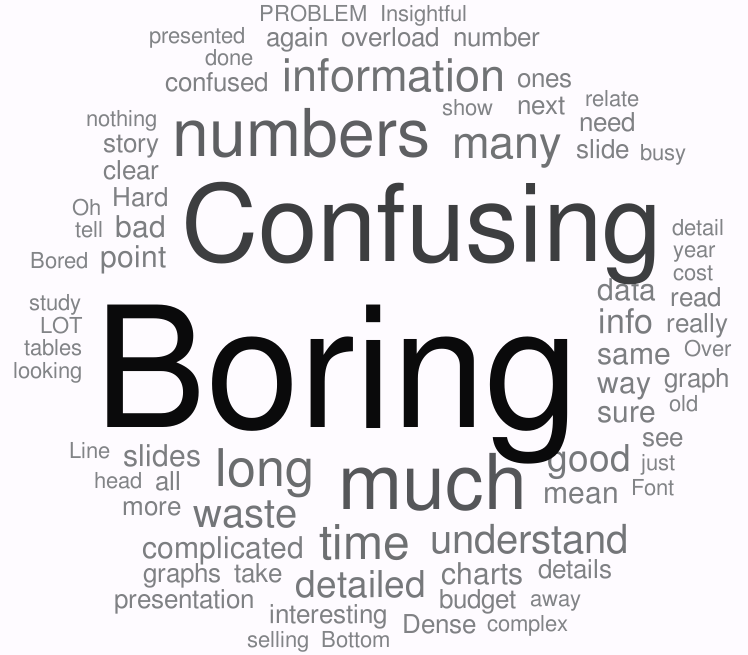 As in the general survey, boring comes out by far as the most frequent word used to describe financial presentations. The root cause is information overload, not just spreadsheets in financial presentations, but paragraphs of text in other presentations as well. When there is an overload of information, people get confused and tune out. By the end of the presentation, they say they are bored because it has been so long since they got anything of value from the presentation. I then moved to asking respondents about what good presenters of financial information do well, and what advice they would have to improve financial presentations. Three themes emerged, and they can really apply to all presenters, not just those who present financial information. First, respondents want presenters to be message driven, not data driven. 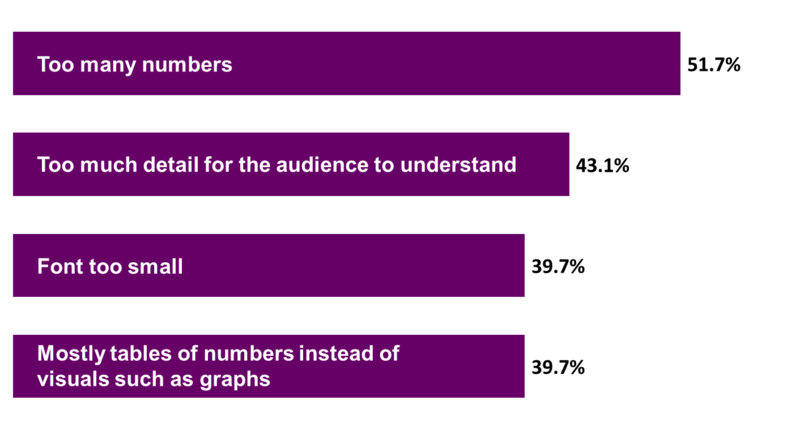 In financial presentations, audiences don’t need to see every number you used. In other presentations, audiences don’t need to hear every step or every thought you considered. Audiences want to know the conclusion of your analysis and what message you need them to take away. Second, respondents said they want the presentation to be relevant to this audience. Every audience is different. Select only the numbers or other information that is relevant to them and their roles. Another aspect of relevance is speaking the language they understand. I hear so often that presenters in all areas throw around acronyms and expect that everyone knows what they mean. Anyone outside your area probably gets lost trying to figure out what sounds like a foreign language. Use language this audience will understand. Third, respondents said they want to see clear visuals. For financial presentations, this means graphs instead of spreadsheets. Any time you have to present numbers, consider how a graph could show the message better than a table of numbers. And with other topics, consider how visuals such as diagrams, timelines, or images would communicate more clearly than text. You can read the full report on my website or you can view the visual document summarizing the key results on SlideShare. Financial presentations can be effective if presenters listen to what the respondents of the survey said and take action to improve their presentations.